The Little Prepper Doc: A New War Cry: The Power of the Pig Stops Here! A New War Cry: The Power of the Pig Stops Here! "He's in V-fib: Get the AED and give him 360J, STAT! Place 2 bore IVs: 16 gage. Ready 1cc of epi, ASAP! What's his BP and HR?!" Okay, so that is not how it really goes. I had to add in some normal words so that anyone reading this wouldn't think that I was trying to send an SOS to the planet Plutekion. Now that I prefaced this acronym style of medical talk, you won't be surprised when I say that the theme of this post is BSI. 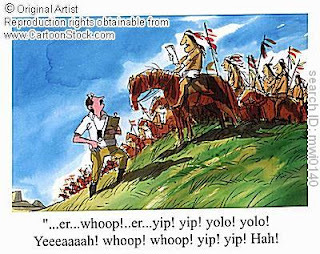 I think since we're taking a war strategy attitude in handling the Novel H1N1 that "BSI", should be our war cry. So let's practice together: BSI! BSI! BSI! It feels great, doesn't it? Wait, I forgot: you don't speak medical geek. So, I will happily translate the acronymese. BSI means.... No, it's not Big Squishy Inkerdinks. I know what you're thinking; you saw this post and thought "Holy inkerdink! That's a lot of swine flu crapola." Instead, BSI stands for: Body Substance Isolation. 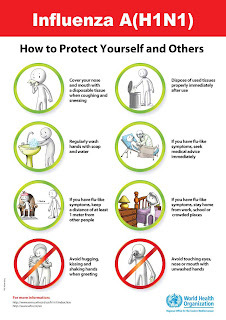 In this case, I'm going to take BSI interchangeably with the idea of how you can protect yourself and your family from contracting the H1N1 from seemingly innocent places. But first, I want to stand on my soap box and state something that is bothering me. I was searching on the net as all we bloggers do when looking for awesome pics to spice up the fruits of our labors. 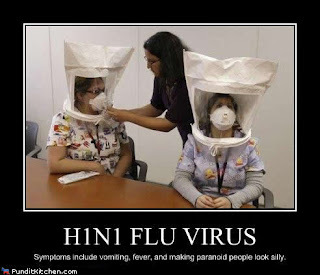 And first, I found this picture of a health care worker getting prepared to screen patients for the swine flu. This is BSI to the extreme, all this person needs is some goggles and you have total body coverage, non-HAZMAT style. Even look at the two face masks the worker is sporting; now, that's some serious BSI right there. I've had to don on this stuff myself before. It was prior to walking into an infected patient's room. Then immediately, upon walking out of their room, I had to strip the gear off and dispose of it in a bio-hazard bin that was right next to the door. The bin had signs above it warning anyone that happened to be crazy enough to look inside a big red, bio-hazard garbage bag in a hospital that it was not a wise thing to do. Then, after all that I had to seriously wash my hands and alcohol my stethoscope. That was hospital protocol. Then, when I came across the image to the right. The first thought that came to mind was: "What the Fahrvergnuegen!? Who's sick and twisted idea of BSI is this?!" I hope they have some seriously giant bottles of hand sanitizer to go with those bathing suits. At any rate, I will nominate this as Example B: The "what the heck were they thinking?" version of BSI. 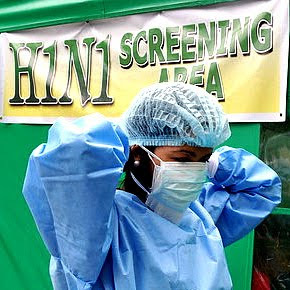 Please compare: Example A, we have Health Care Worker style of preparing for the H1N1. And Example B, we have Malibu Barbie and Ken style of preparation. Which version are you in support of: A or B? I should open a voting link or something. Anyway, this is not to say that we should go over board and break out the surgeons' gowns, gloves, boufont caps, and N95 masks every time we go outside. But there is an interesting dichotomy of the understanding of the H1N1 presented in the above two pictures. Okay, to be fair to bikini Barbie, face masks are great, especially if they are N95 face masks that are designed specifically to filter out bio particles. Yet, most viruses we catch, are contracted from the things that we touch. And if the bikini couple were near individuals infected the swine flu or infected items with all that skin? ... Well, you do the math. 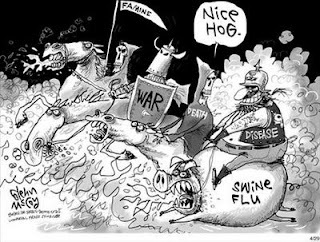 Enough of my little soap box, let's talk about the places and things where can possibly acquire the swine flu. The grocery store: Shopping carts (not just the handles), grocery bags, canned foods, produce, money, key pads, Pharmacy counters, etc. Anything you touch, someone else can touch. -Now most grocery stores provide sanitation wipes for the cart and hand sanitizer at the cashiers. -Also, any other type of stores: Dressing room handles, toys on display, dvd packages, rack clothing, etc. Gas station: I know everyone fears the germs that could arise from the gas station bathroom. But the gas pumps and squeegees can be H1N1 perpetrators as well. -Here's a scenario for you: You take your keys from the ignition and get out to pump some gas into your poor hungry car. You grab the pump handle and set it to automatic, so you can squeegee your windows. After you're done with all that, you get back into your car, use your keys to start her up, and then steer out of there. If that handle or squeegee was carrying H1N1, then you have just infected your hands, your car keys, your car door handles (inside and out), and your steering wheel. Moral of the story: Hand sanitizer and disinfectant spray are our friends. Public and home restrooms: Commode seats, handles, fixtures, and bathroom doors. Banks: Bank counters, bank pens, money, credit card and ATM keypads, the teller window canisters and buttons, the free candy they give you for letting them do wonders with your life savings, etc. Church: (This is a sad one, and I am definitely not promoting the avoidance of Church, or any of the places listed here for that matter. So those of you that get the "Sunday flu" don't go to your family saying that Christine told you that you had to stay home from Church to watch Football in order to stay healthy.) Hymn books, offering plates or trays, pews, Church nursery toys, pamphlets, podiums, etc. -Copy and fax machines, pencils, pens, shared keyboards and mouses, coffee makers, chairs, couches, desks, backpacks, lockers and locker rooms, passing notes (Hah! Got you kids! Try texting instead. ), etc. The Mall: Self-explanatory. But I will add here arcades and game handles, video game controllers in electronic stores where people sample games, elevator buttons and escalator handles, etc. Also, I am not intending to turn all of us into Howard-Hughes-germ-a-phobes, where we go around for the rest of our existences worried that we'll catch anything off of everything. But instead, I am hoping that we all acquire an extra sense of caution and try to practice the BSI protocols of washing of hands or wearing disposable gloves after touching things in public places during this flu season. And then, cleaning surfaces with disinfectant sprays. All in all , the bare minimum suggestion that I am going to make when you are in situations where you will come in contact with people that ma have H1N1 is that you avoid taking the Malibu Barbie style of BSI and at least wear: gloves, an N95, eye protection (such as goggles), and carry sanitizer wipes, and/or hand sanitizer. Then take a really nice shower after wards. Also, I suggest getting one gianormous can of disinfectant spray that is labeled kill viruses, if you haven't already purchased one. This is Christine the Medical Student wishing you a happy BSI filled night!